I flipped the page on my calendar on May 1st, and realized that I really only had one month left in Toronto before departing for the United Kingdom. 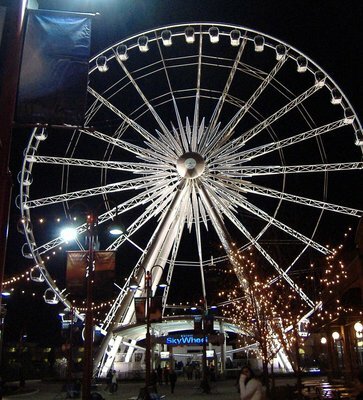 Despite living here all my life, or actually more likely because of it, I realized that there were a number of things that visitors to Toronto seek out that I hadn't seen in a long time, and in some cases ever. So, along with getting ready for my trip, all that packing I talked about in my last entry, and going to for drinks with all my friends, whom I suspect are just seeing me off so they have a free place to crash in London, I have been treating my hometown like I was a tourist visiting it for the first time. I've still got a couple weeks to go of being a tourist in my hometown, but thought I would share some of my experiences up to this point. First up was a trip to Niagara Falls (which actually took place in April, but we'll pretend it took place in May, otherwise the whole "Flipping the page on the calendar and realizing my time was short" literary device falls apart). 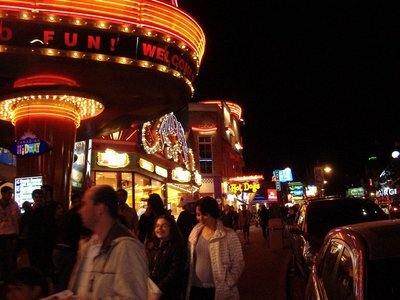 I briefly saw the falls, but most of my time was spent walking around the tourist zone of Clifton Hill and in the Casino. 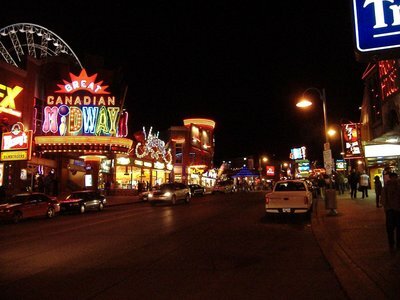 It is very tacky and overpriced, and in a lot of ways detracts from what is an otherwise beautiful and majestic natural wonder in the falls, but it can be a hell of a lot of fun. After all, they have a MIDWAY! Luckily, the weather in Toronto this May has been quite nice, so it's been good weather to go and hang out on the patios of my favourite bars. 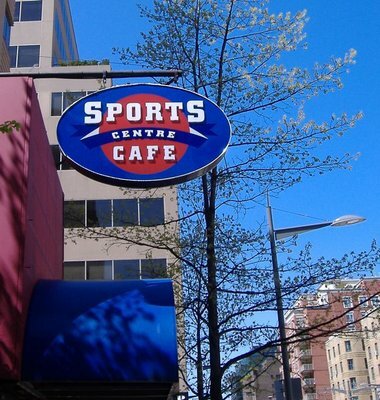 The Sports Centre Cafe, at 49 St Clair Avenue West is my favourite year round location. A good selection of beers, excellent views of multiple TV sets to watch your favourite teams and some very pretty waitresses and bartenders make it a cool place to go. It always reminds me of sitting in a medieval square in Eastern Europe drinking, even though I have never been to Eastern Europe, but I imagine that you would have a similar view of an old church while sitting on a sunny, Prague patio. The nice weather has given me the opportunity to spend some time just walking around checking out the city, and I took a few snaps of nice places and views. 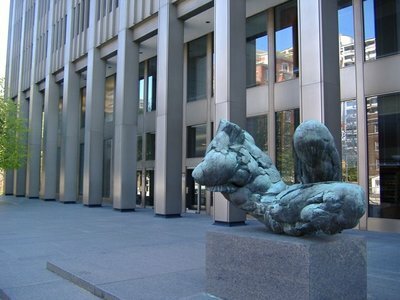 The following statue is on St. Clair Ave. W, between Yonge and Avenue Road. 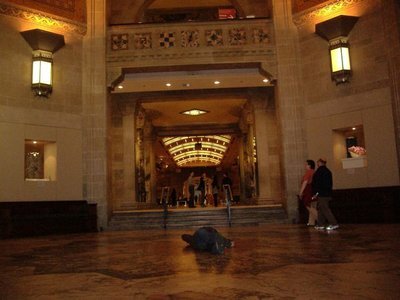 It is a man's torso, lounging in front of a building that sells insurance. I am not sure if it is meant to represent the relaxing attitude one can take when one is fully insured, or the fact that your insurance will probably cost you a couple arms, a couple legs and a head just to afford it. 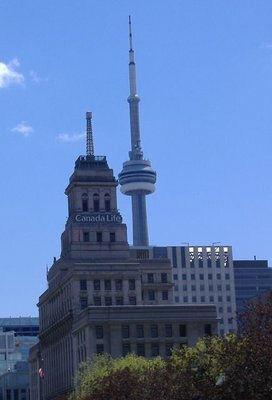 The Canada Life Building in the foreground, with the CN Tower in the background. The Canada Life Building is interesting for its weather predicting abilities. Atop the building is a weather beacon which shines red for rain, white for snow, and lights running up or down it indicate a change in temperature. It provides "weather at a glance," and if you want to be able to decode its sometimes cryptic signals, check out the handy decoder at Wikipedia. 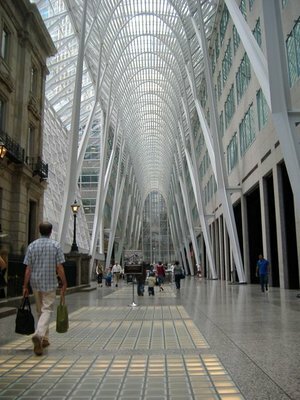 Official known at The Allen Lambert Galleria, it was the result of an international competition and was incorporated into the development in order to satisfy the City of Toronto's public art requirements. The atrium was designed by Spanish architect Santiago Calatrava, and is one of my favourite places to hang out in downtown Toronto. It also is a favourite place for film directors to film, especially for crappy sci-fi films, as it looks very futuristic. 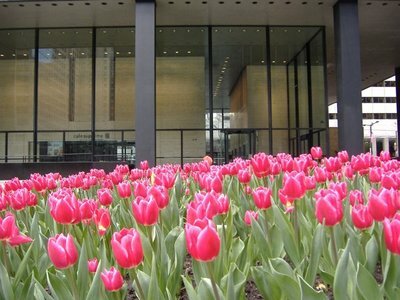 These tulips are in bloom outside of the Toronto Dominion Centre, where I had my first job in Toronto back in 1992. I was a computer programmer at a large bank in the Centre, and I put on 30 pounds that summer from just sitting behind a desk and not doing any sort of physical work. Damn you, Computer Science Degree, for making me fat! Back to the more tourist sites, I went to the Royal Ontario Museum recently, the first time I had been there since the expansion of the museum with the Michael Lee-Chin Crystal. The crystal was designed by architect Daniel Libeskind and Bregman + Hamann Architects, and provides an ultra-modern contrast to the older Neo-Romanesque building. 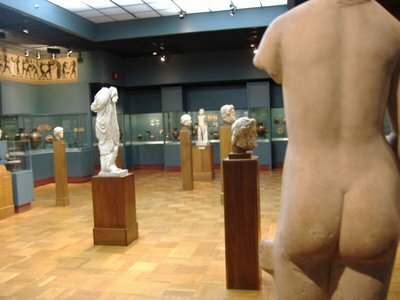 The ROM has lots of exhibits, including dinosaurs and Greek statues. 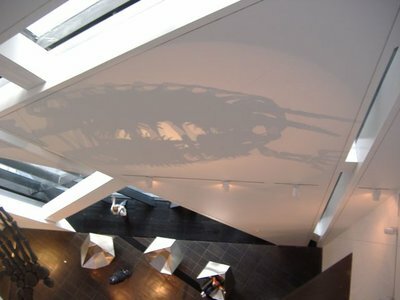 That's the shadow of a dinosaur skeleton on the wall. It's scary, like Jurassic Park meets the scene in Sinbad where the skeletons attack his crew! 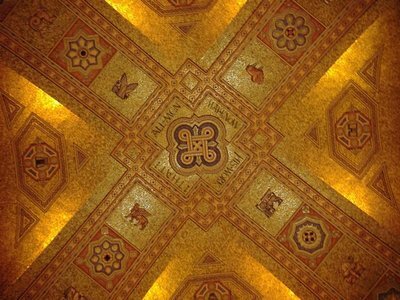 Very impressive in the museum is also the architecture, especially the ceiling in the main atrium. 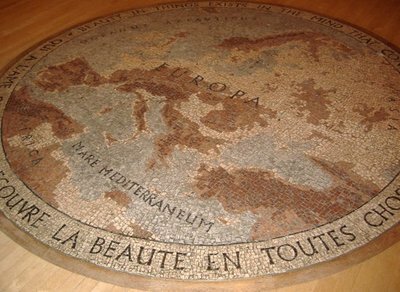 It's worth taking a short lie down just to admire it. 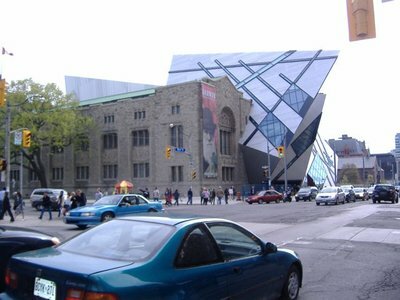 The ROM is in the area called Yorkville, which is a very "posh" area of town with tons of fancy restaurants and bars. 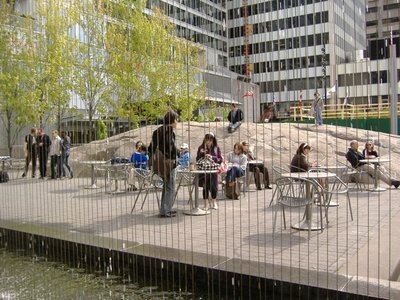 It also has a pretty nice little open area, with a nice water feature that people like to have lunch or coffee nearby. Finally, yesterday I went and saw the Toronto FC of the MLS (North American Soccer) play the Columbus Crew. I happened to wind up, without any fore planning on my part, in section 118, which is the home of the Tribal Rhythm Nation. 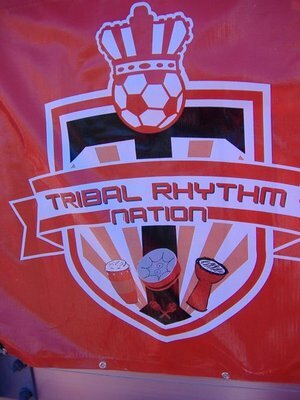 The Tribal Rhythm Nation is a support group of the Toronto FC that, according to their website, "This movement was created to bring a true multi-cultural presence to Toronto FC soccer games. We represent the African, Caribbean and Latin communities in the GTA. 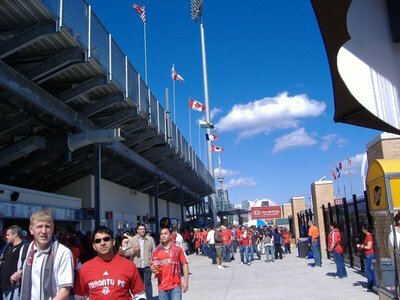 The goal of the Tribal Rhythm Nation is to create an atmosphere at Toronto FC games that energizes the whole stadium. The beat of our drums will be heard by all." It is a very different atmosphere than my last trip to BMO Field to see the Toronto FC, with whistles, drums, chanting, singing and lots of flag waving. It was a lot closer to the experience I had last year seeing the 2007 Under 20 FIFA World Cup finals in Toronto, and probably good preparation for what I will experience at soccer... er, I mean football matches in the United Kingdom. Another two weeks of packing, having drinks with friends and a few more tourist experiences to go until I can see if I'm right about the atmosphere at European football matches. If you've got any time left you should visit Casa Loma - where X Men was filmed..all 3 of them! There's quite a sad story behind the family who built it but well worth a visit. 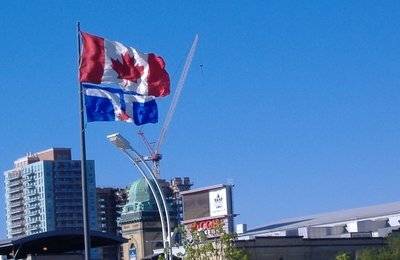 My boyfriend and I spent 10 days in Toronto a couple of years ago and it was a fantastic city. Thanks Leanne. 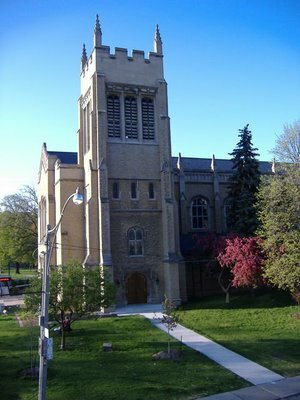 I actually live right around the corner from Casa Loma, so I have seen it many times, though I may go by for just one more look. Just one point is that Casa Loma was only used for the first X-Men movie. X2 and X3 were filmed in Vancouver, and I believe another location was used for the shooting at the X-Mansion. haha i love the satire in this post. I'm from t.o. and am flying out to london the oz at teh end of teh month also. Should we backpack the great t.o. together? hahaha. I hear theres a good pub called Gracie O'malleys somewhere. To late for me to backpack T.O., I'm already over in London. I did like Gracie O'Malleys - it's on Duncan street between King and Adelaide. Nice place, good atmosphere, live music and cute waitresses.